Back during Earth Science Week in October, I was thrilled that our campus was able to receive a free copy of the latest documentary from James Balog, titled The Human Element. Here is a video trailer of the movie, and you can read my blog post at AGU that reviews the film. 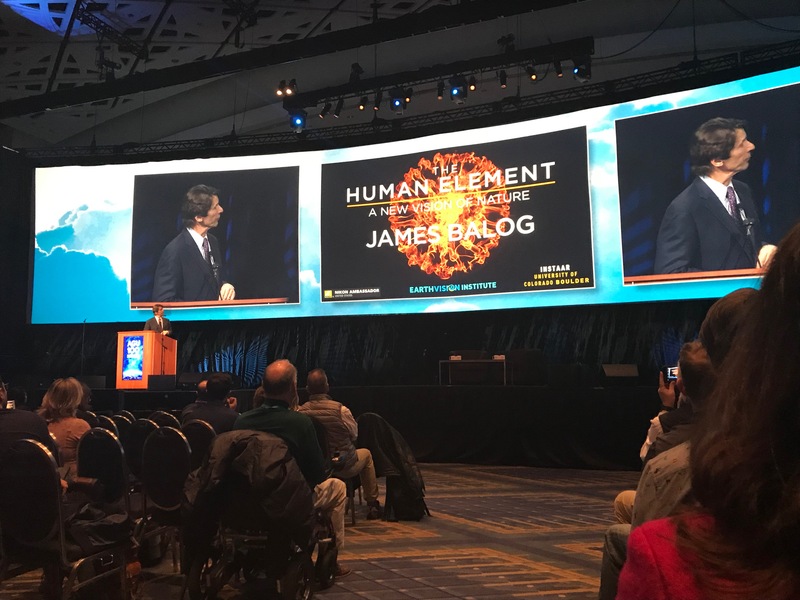 For the 2018 AGU Fall Meeting, James Balog was the speaker for the Frontiers of Geophysics Lecture, filling an enormous ballroom with attendees looking for information and inspiration on his latest work. I won’t repeat the information that is in my AGU blog post or stories from the film, but I’ll highlight some of the new ideas I have not heard from him during previous lectures. James started that as the Frontiers of Geophysics speaker, he sees the “frontier” at the contact zone between science and society – specifically, between science and the visual arts. He emphasized that human civilization needs a new vision of itself, as well as a focus on choice (moral, ethical, philosophical), voice (we have one, we need to use it), and truth. I appreciate his reference to the Declaration of Independence, that if our founding fathers knew what the world would be like today, we should have the inalienable right to clean air, clean water, stable climate, and truth. I also jumped over to the interview by AGU’s podcasting team, who produce an Earth and space science podcast titled Third Pod From the Sun. 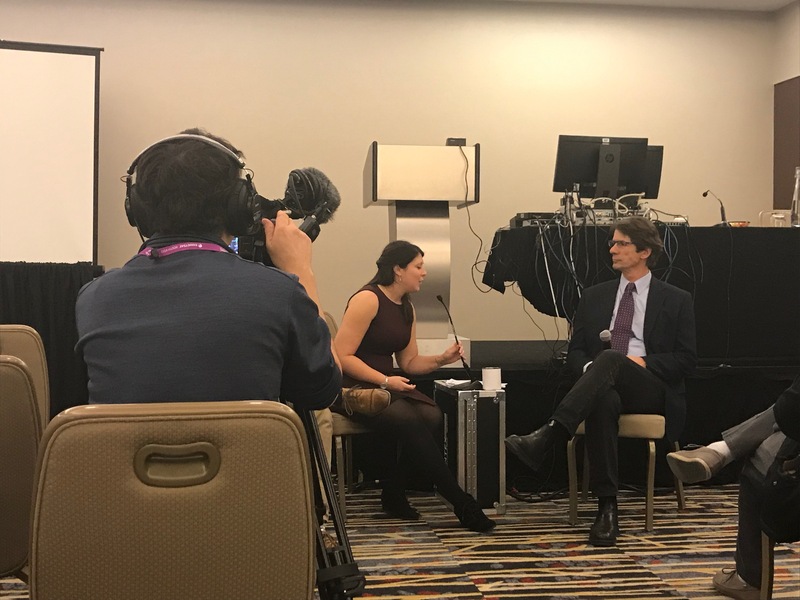 For an hour, the AGU co-hosts of the podcast asked James a series of questions, from how he got started to the rewards and dangerous parts of his job. I’ll post a link to the podcast when it goes “live” so you can be part of the audience, too! The final question for the podcast is a question that AGU ends every podcast with: How is the world going to end? James said he has witnessed the aftermath of two events which he believes accurately captures what we will see. The Indonesian tsunami had wiped out entire buildings and communities along the coast – for miles, he saw no evidence of human life or structures. And after Hurricane Katrina, he was driving towards New Orleans at night, where all he saw was one small light on top of a building, with the entire urban skyline dark. Those are visuals he feels would be what we see at the end of human civilization. But James Balog refused to end on a negative note! He then reminded us in the room that we have a duty, honor, and noble purpose for Earth and the human race. He feels it is his duty to be here (at AGU) now, and that his work has meaning and purpose. We were each asked to do everything we could to get in front of influencers (yes, it can be challenging), that we need to keep moving the needle however far we can move it with our own voice and with our own ways. I hope this is the message my students are receiving at the end of a semester with me as well! I wish James Balog could come and say it to them himself, too!